The fact that humans can build big, complicated machines is commonplace. But the fact that we can build these massive machines and then move them, sometimes across the planet? That's not so common. While most machines can be assembled and disassembled in situ, every so often there's a huge part of a mechanism—or sometimes the whole machine—that must be transported in one piece on road. Behold the following heaviest haulage cargos that ever blocked the roads. 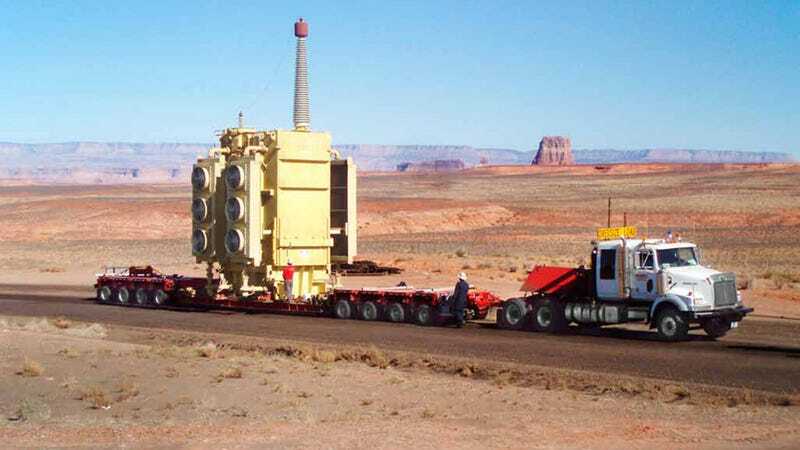 In 1988, the two Heat Transfer Reactor Experiment (HTRE) reactors of the Idaho National Laboratory were hauled to the visitor center at the site of Experimental Breeder Reactor I. Here's the delivery of the Post-Stripper HILAC (heavy ion linear accelerator) tank on Cyclotron Road (at the horseshoe curve), on April 16, 1956. 16th January 1967: A section of the giant Saturn V-Apollo rocket being transported from its building site to the launch pad in Cape Kennedy. March 1, 1965: the Saturn V static testing stage (S-IC-T)–not intended for flight–being moved from the Manufacturing Engineering Laboratory to the new S-1C Static Test Stand at NASA's Marshall Space Flight Center in Huntsville, Alabama. 2013: This massive electromagnet, the Muon g-2 storage ring, arrived after a cross-country journey from Brookhaven National Laboratory to Fermilab. An SR-71 Blackbird in transport between Burbank and Palmdale in the mid-1960s. The space shuttle Endeavor is on its 12-mile journey from Los Angeles International Airport (LAX) to the California Science Center, on October 12, 2012 in Inglewood, California. The fuselage of a decommissioned B-1 bomber is trucked westward on Interstate 70 near Greenfield, Indiana on October 18, 2003. The disassembled bomber, once displayed at the Wright Patterson Air Force Base in Dayton, Ohio, was escorted by Indiana State Police and headed for the Strategic Air and Space Museum in Ashland, Nebraska. 2011: A flatbed truck carries the fuselage of US Airways flight 1549, the plane that made a miraculous landing on the Hudson River on January 15, 2009, to the Carolinas Aviation Museum in Charlotte, North Carolina. 26th November 1951: The first British-made aluminum alloy barge, being taken by road from Dagenham to Avonmouth, to be shipped to Rio de Janeiro for use as a coal depot. Circa 1949: A Hackbridge transformer on its way from Surrey to the Victoria Docks, for shipment to Canada. 1930: "The world's largest lorry" carrying a boiler. Escorted by Massachusetts State Police, trucks tow and push the flatbed truck carrying a reactor vessel, encased in concrete, from the shutdown Yankee Rowe Nuclear Power Station in Florida, Mass., Sunday, April 27, 1997. A replica of the Orion Multi-Purpose Crew Vehicle (Orion MPCV) is transported to the inaugural parade, on Jan. 20, 2013, in Washington D.C.
A wind turbine blade on the back of a flatbed trailer near Brighton, Colorado, March 25, 2009. Dr. Charles Springer, Director of the Advanced Imaging Research Center at Oregon Health and Sciences University, watches as the third and largest MRI magnet is transported on a specially built flatbed trailer to the hospital in Portland, Oregon, Saturday, Jan. 21, 2006. Heavy tunnel digging machinery—loaded on a flatbed trailer—is carried to the construction site of Stuttgart 21, on December 12, 2013 in Ostfildern-Scharnhausen. Moving petrochemical columns and machinery is Panalpina's speciality. The Swiss logistics company is one of the market leaders in heavy freight solutions. These two gas phase reactors were being carried from Linz to Burghausen. And finally, these incredibly huge off-shore oil rig parts are being moved on wheels.